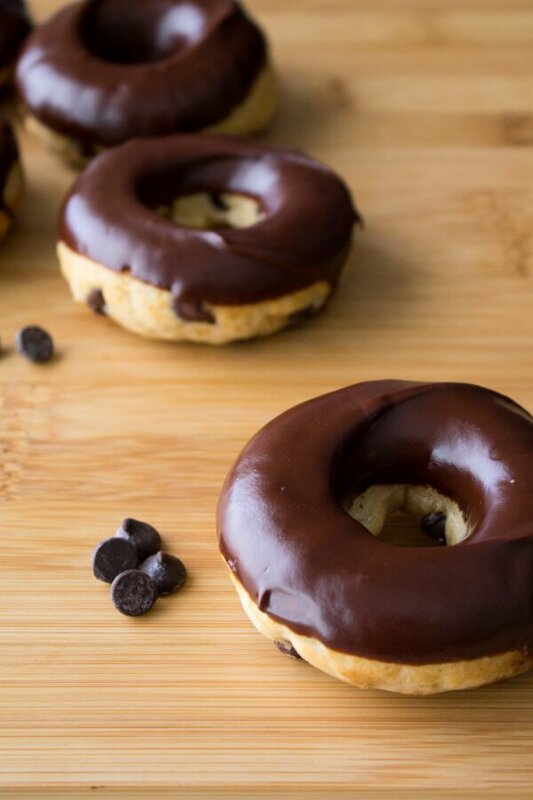 Chocolate Chip Doughnuts with Chocolate Glaze. Because with chocolate chips & baked cake doughnuts – you can’t go wrong! Time to put that doughnut pan to good use. After a quick peruse through my cupboard, I found a bag of chocolate chips. Hmmmm…. Chocolate Chip Doughnuts. Is that a thing??? 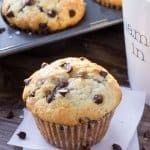 Chocolate chip muffins are delicious. And you can never go wrong with a super tasty cake doughnut. So, I made it a thing – Baked Chocolate Chip Doughnuts here we go!!!!! Now, these chocolate chip doughnuts are super tasty. 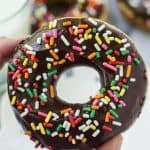 They’re similar to eating a chocolate chip muffin for breakfast or dessert, but they have that delicious texture of a baked cake doughnut. Plus, they take less time to make than muffins. And you get the benefit of having them dipped in chocolate glaze. Hello there my new favorite breakfast. Don’t you look tasty! For the ingredients, there’s a couple of keys for super tasty doughnuts. First, I use melted butter in this recipe as opposed to oil. Since the doughnut base is plain vanilla, the flavor really benefits from that buttery goodness. There’s also nutmeg in the recipe and I really can’t stress enough the importance. Nutmeg is key for that perfect doughnut taste. They don’t taste like a spice cake one bit – it’s actually the nutmeg that’s key for giving doughnuts that perfect bakery-style taste. Then finally – buttermilk for that perfect soft crumb. Now, just like making other cake doughnuts using a doughnut pan, these come together in minutes. You’ll first whisk together the dry ingredients in one bowl. Then the wet ingredients in another bowl. And finally add the wet ingredients into the dry and whisk them together until combined. Then fold in the chocolate chips and you’re ready to bake. To get the batter into your doughnut pan, I prefer to use a large ziplock bag. Spoon the batter into your bag and seal it closed. Then cut one of the bottom corner tips off, and pipe the batter into the cavities of the doughnut pan so that they’re about 2/3 to 3/4 full. You can spoon the doughnut batter into the pan – but I find using the ziplock bag trick works best for getting uniform doughnut shapes. 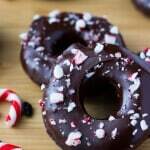 After your doughnuts are done baking – it’s time to get onto the chocolate glaze. Because clearly, you can’t have doughnuts that aren’t frosted or covered in sugar. This recipe uses a super quick chocolate ganache glaze for big chocolate flavor and a very professional look. 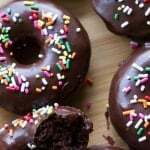 Simply melt your ganache ingredients, and let your doughnuts take the plunge into your delicious chocolate. 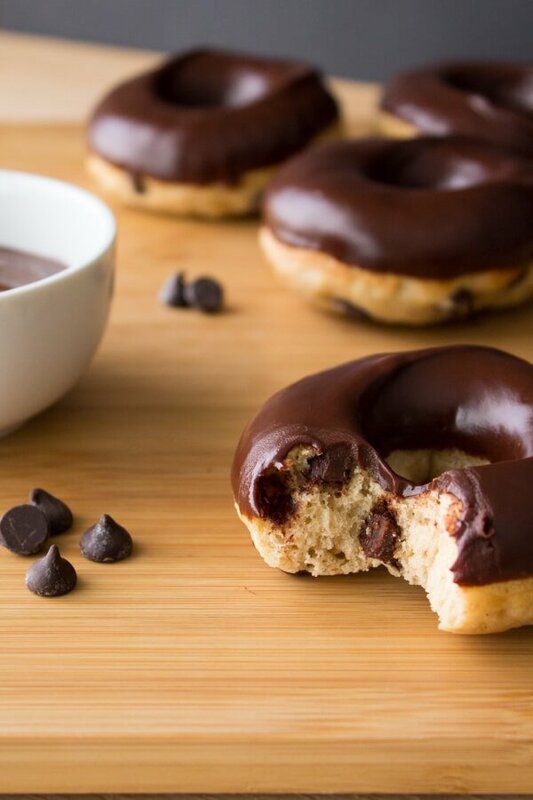 Chocolate Chip Doughnuts with Chocolate Glaze. Because with chocolate chips & baked cake doughnuts - you can't go wrong! Preheat the oven to 350F degrees. Spray a doughnut pan with non-stick cooking spray and set aside. In a large bowl, whisk together the dry ingredients (from the flour through to the salt) using a hand whisk. In a separate bowl, whisk together the melted butter, egg, buttermilk & vanilla. Pour the wet ingredients into the dry and whisk to combine. Once almost combined, fold in the chocolate chips using a large rubber spatula or wooden spoon. Spoon the batter into your doughnut pan until each cavity is 2/3 or 3/4 full. Alternatively, spoon the batter into a large ziplock bag, zip closed the bag and cut one of the bottom corners off. Use the ziplock bag to pipe the batter into the doughnut cavities. Bake doughnuts for 8-10 minutes, until they lightly spring back when touched with your finger tip. Allow doughnuts to cool in their pan for 10 minutes, then remove and continue to cool on a wire rack. *If you don't have buttermilk, add 1 teaspoon vinegar to 6 tablespoons of milk and let sour for 5 minutes before using. Oh my. I received a donut pan for Christmas and am now looking at so many recipes. My mouth is watering! These look phenomenal, though, and would be so fun to make for the office. I can even see them covered in sprinkles for Valentine’s day 😉 Can’t wait to try! Thanks so much. 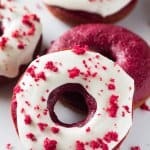 I absolutely love my donut pan – and I think your office will definitely be excited if you bring these to work! There’s an asterisk by the buttermilk but no explanation. Can you clarify? Thanks for the catch. If you don’t have buttermilk you can add 1 teaspoon of vinegar to 6 tablespoons of milk and let the mixture sour for 5 minutes before using.